The U.S. pricing details of the much awaited Kona Electric have been released. Prices will start from $29,995 after the $7,500 federal tax credit ($37,495 without it). Hyundai’s fully electric car rides on a new CUV platform and is the company’s first compact utility for the US market. The Kona’s three trim levels: SEL, Limited and Ultimate are all powered by the same 201 HP and 291 lb-ft (394 Nm) electric motor. All variants of the model come with a 64 kWh lithium-ion battery pack. The Kona Electric has a remarkable estimated driving range of 258 miles (415 km) and utilises DC Fast-Charging as standard. This makes it possible to charge the battery to 80 per cent in just 54 minutes when plugged into a Level III 100kW charger. When using a Level II 7.2kW charger, the same process takes nine hours and 35 minutes. The car from South Korean was first presented in February of last year. In Europe, prices were already released in June of last year and in Norway shortly afterwards, where the Kona became vastly more successful than expected. 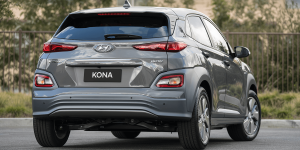 2019 Kona Electric models are made in Ulsan, Korea and are now initially available in California and subsequently in the ZEV-focused states in the western and northeastern regions of the US market.